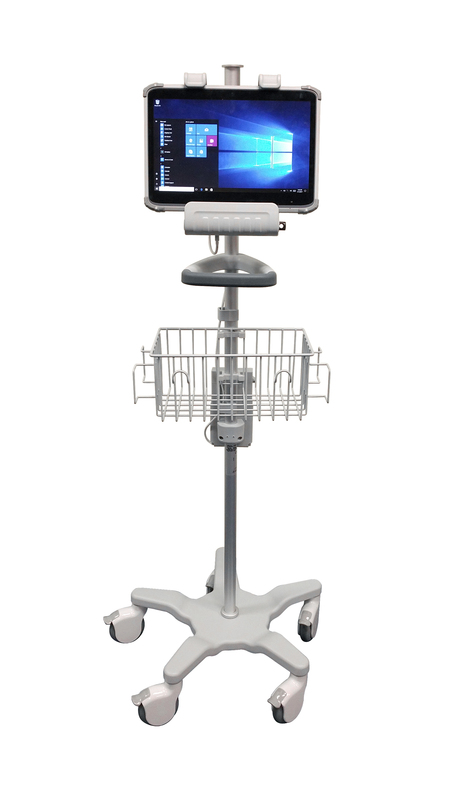 /EINPresswire.com/ -- SAN JOSE, CA--(Marketwired - June 05, 2017) - DT Research, the leading designer and manufacturer of purpose-built computing solutions for vertical markets, today announced the DT313-MD, a 13.3" medical tablet system mounted on a slim-line, lightweight cart. The purpose-built system offers maximum computing mobility in a variety of medical environments. Healthcare professionals can efficiently monitor, record and retrieve patient information with the anti-microbial DT313-MD tablet, which includes DT Research's signature hot-swappable battery pack to avoid downtime in time-critical situations. "Today, medical cart computers are an integral component to deliver consistent point-of-care service in medical settings," said Daw Tsai Sc.D., president of DT Research. "Mobile computers enable healthcare providers the ability to streamline their workflows while simultaneously achieving patient objectives. Our new lightweight Medical Tablet Cart offers additional flexibility and convenience for healthcare providers, while meeting the necessary medical environment and power standards." DT Research collaborated with GCX Corporation, a worldwide leader in medical instrument and IT mounting solutions, to design the purpose-built tablet cart, which is unique in the medical industry. The DT313-MD Medical Tablet is docked in an ultra-lite, yet durable metal construction rolling stand with a locking mount to ensure secure operation. A wire basket is also included to hold essential medical supplies. With a touch of a button, healthcare professionals can use the tablet without the cart and easily carry it with a built-in ergonomic hand strap designed for comfort. "DT Research's medical tablet with the slim cart design creates a fully mobile healthcare computing solution that enables real-time information sharing and streamlines data capture and management," said Clint Thompson, vice president of Sales for GCX Corporation. The DT313-MD Tablet has been carefully designed by DT Research to meet the unique requirements of the medical industry including an anti-microbial enclosure for the tablet, docking cradle, and battery holster. A battery pack is mounted directly to the cart, which allows users to use the tablet in upwards of 16 hours without changing the battery. In addition, the batteries are hot-swappable to provide uninterrupted 24/7 tablet operation. To enhance the system security, the DT313-MD Tablet has an optional Intel RealSense front camera that supports gesture, facial expression, and speech recognition. The camera also provides 3D scanning, environmental sensing, and background segmentation. The DT313-MD Medical Tablet Cart System is currently available from DT Research's authorized resellers and partners. For more information, go to goo.gl/KdmEvW.